A new book reveals a collection bought by the wife of the Shah of Iran in the 1970s. Alastair Sooke talks to Farah Pahlavi, who was known as the Jackie Kennedy of the Middle East, about works by the likes of Bacon, Warhol and Picasso stored in the vaults of a Tehran museum. 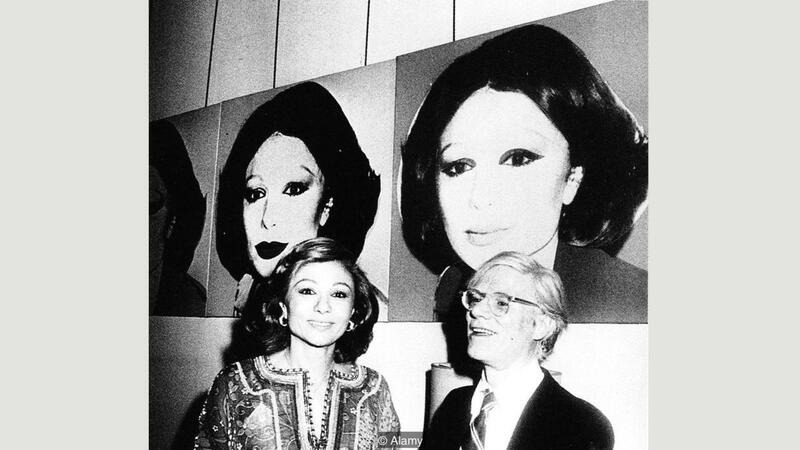 “The first time I met Andy Warhol was in Washington, at the White House,” says Farah Pahlavi, the exiled widow of the last Shah of Iran, who was overthrown during the Islamic Revolution of 1979. Wearing a badge on her lapel in the shape of her homeland, emblazoned with the Pahlavi coat of arms, the 80-year-old ‘Shahbanu’, as Shah Mohammad Reza Pahlavi’s queen consort is still known among supporters, is sitting in a smart bookshop on Piccadilly in London, recalling a visit to the US in 1975, when she attended a dinner at the White House hosted by President Gerald Ford. In front of her is a copy of Iran Modern: The Empress of Art, a lavish new publication that tells the extraordinary story of a collection of around 150 modern Western artworks that Iran’s imperial government acquired during the 70s, under her supervision. Not so shy, however, that the American Pop artist didn’t agree to make a portrait of Pahlavi, who used to be known as the ‘Jackie Kennedy of the Middle East’. In the summer of 1976, Warhol arrived with his manager, Fred Hughes, at what was then the empress’s home, the Niavaran Palace in Tehran, to take a Polaroid of her, wearing a simple cream blouse, which he used as the source for a series of silkscreen portraits. “North Tehran reminded me of Beverly Hills,” recalled a member of the artist’s entourage, Bob Colacello, who had stayed at the Intercontinental Hotel, where, apparently, Warhol relished ordering caviar from room service. A couple of years later, Warhol was invited to make another portrait, of the empress’s husband, though this time he was obliged to work from an official photograph. Yet, just a year after that, the Pahlavi dynasty was toppled, and the Shah fled to Egypt – where he died, in 1980 – with his wife and family. The former empress – who today, aged 80, lives between Maryland, in the US, and an elegant apartment overlooking the Seine in Paris – left behind Warhol’s portraits, along with the rest of the 300 or so works of modern Western and Iranian art that she had amassed during the 70s, funded, with her husband’s blessing, by the country’s oil wealth. Today, that little-seen collection – which survives, almost intact, in the vaults of the Tehran Museum of Contemporary Art (TMoCA), which Pahlavi inaugurated on her birthday in 1977, with Nelson Rockefeller in attendance – contains masterpieces by the likes of Francis Bacon, Alberto Giacometti, René Magritte, Pablo Picasso, Jackson Pollock, Pierre-Auguste Renoir, and Mark Rothko. According to some estimates, it is now worth as much as $3bn (£2.35bn).